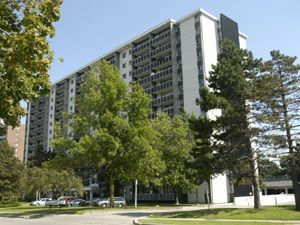 Large, bright, air-conditioned suites located in downtown Etobicoke, just a short walk from Islington subway station. Located steps from the Humber river, 105 La Rose Ave features 12 stories of large, bright, 1, 2 and 3 bedroom suites. 4 storey twin courts located in historic Town of Islington. A 50 townhouse complex located steps from Centennial Park, at the corner of Renforth and Rathburn Roads.